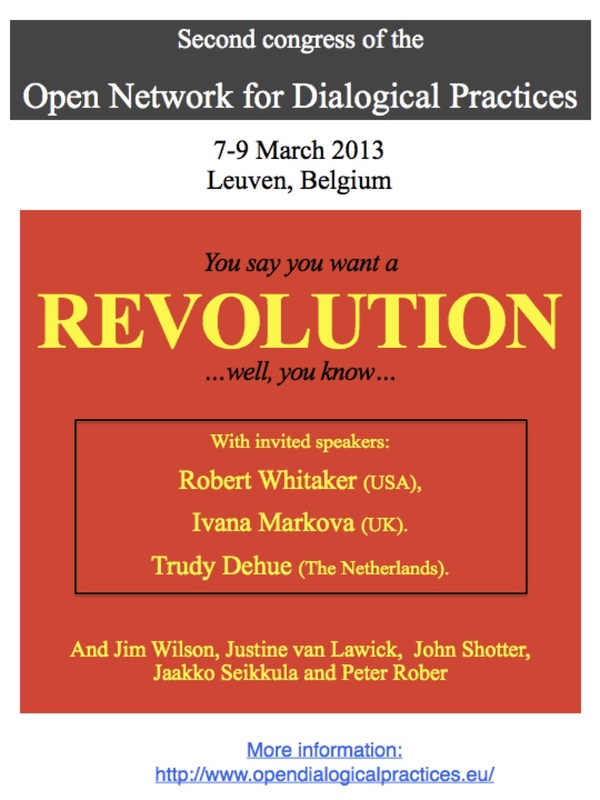 Personal impressions of the second Congress of the Open Netwerk for Dialogical Practices in Leuven, Belgium 7-9 March 2013, called the Revolution Congress. The congress consisted of plenary sessions, working groups, workshops, well catered coffee and lunch breaks, a fantastic dinner party and a grand finale with amongst others a performance of the Leuven percussion group: Locomotiv. It was opened by Peter Rober, family therapist and professor at the Catholic University of Leuven. It was very bold to give the conference this name; the Revolution Congress, said Rober. Of course there is a lot of concern about and criticism on contemporary diagnostic labeling, the amount of medication used and the empasis on the brain in the field of mental health. Most mental health workers have these concerns and criticisms. Rober prefers that there was more emphasis on words and on attachments between people instead. And then there is the problem of defining the goal of the revolution. It is not so easy to define where we want to go to. Even Thomas More, the father of Utopia, had difficulties with describing his ideal society. How can we think about an ideal society or an ideal mental health organisation with words of the society or the system we live and work in now? Rober showed us – 125 mainly mental heath workers, from nurses to psychiatrists from all over the world – a video recording made in 1971 by Dutch Television, of a discussion between Foucault and Chomsky. Two great thinkers about change. Chomsky thinks that people want to be creative and that the system should not force people and not keep them down. Fouceault thinks that we should understand the power balances in the society that we are in. Power is also in psychiatry. We have to deal with power in our everyday life according to Fouceault. Chomsky is in favour of civil disobedience. Foucault does not believe in an ideal liberated society. We have to resist and challenge the system, to research and try to understand the system. Rober showed us three different schemes in which the client, the oppressing society and the therapist take in different positions. Derrida and the concept of Aporia was presented. Aporia is in ancient Greek a word for impasse, puzzlement. A word is often hard to define. Also the word ‘love’ can be seen as ‘a tension filled space’. Do you love someone? Or do you love someone’s qualities? There is according to Derrida always a tension between the absolute imperative and the conditional practice. Rober ended his opening speech talking about the great Russian thinker: Bakthin, who talks about the tension between concepts being descriptive and prescriptive at the same time. For the time being Rober prefers the idea of an unfinalizable revolution and the idea of tension between what is en what could be. After Peter Rober, Jaakko Seikkula, psychiatrist from Finland, spoke. What is his dialogical network all about? It is about the basis of human life: open dialogue. Seikkula presented a beautiful example of how open dialogue works in an Italian school where teachers first make contact with pupils before they start teaching. The idea behind this is that nobody can learn anything if one has fear. The teachers want to give space to the pupils. If a pupil gives a ‘wrong’ answer, the teacher asks: ‘What makes you think so?’, instead of correcting the pupil. In dialogical practice one is inside the relation. Bakthin says: No one can deny the voice of the other and the only way to go is to have dialogue between all the voices. We can always find common ground between ourselves and the other. Ivana Markova, emeritus professor in psychology, was then introduced. She focussed on some of the concepts that we are currently using. For example the fashionable word: evolution. The idea of evolution is that we progress in an upward direction. We think for example that we as humans could become more and more rational. According to Bakthin however we cannot transcend to higher stages because we will always stay human agents. What is dialogue? Markova distinguishes four ways we can look at dialogue. 1. Face-to-face interaction or written dialogue between individuals. 2. Internal dialogue. We can have external and internal dialogue at the same time. 3. Dialogue between ideas. These dialogues form the social context we live in. 4. Dialogue between cultures an historical era. The essence of dialogue is intersubjectivity and the search for social recognition. Clients are also agents with a point of view. As a psychologist Markova has worked with deaf-blind people and with people with cerebral palsy and studied how they express themselves as human agents that communicate ideas. And they do that with all their handicaps! Then there is the word dialectic. This word refers to the tension and the conflict in a dialogue. And then a word translated from Russian: outsideness. This is a word from Bakthin. Markova prefers to talk about ‘strangeness’ instead of ‘outsideness’. Every dialogical encounter is unique. Tension in dialogue is always present and strangeness one tries to overcome. One tries to find common ground. Markova thinks that we can learn more from individual case-studies than from inductive research. Another concept is trust. Trust that you have something in common with the other person. Trust in dialogue is more essential than love or attachment according to Markova. There are different types of trust. Trust between me and you. Trust between me and an institution. There is the basic trust of a baby. 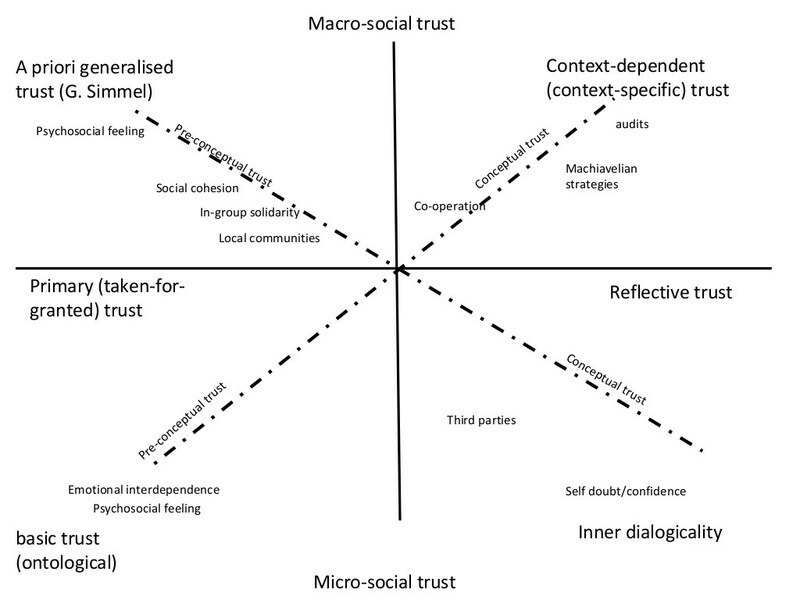 Markova presents 8 different types of trust in a diagram. After Markova’s presentation there was a dialogue between her and Rober on the basis of a few images. The first image we see, is of a young child in an embrace with a stuffed toy animal much larger than the child himself. Rober asks whether this image could mean that the child is giving his trust to a stuffed animal. Markova thinks that the image is more about attachment or about feeling insecure, than about trust. Then we see an image of the house where George Orwell (1903-1950) has lived. Under his nameplate we see a surveillance camera mounted on the facade saying: “24 hours recording in operation”. Markova comments: This image is an example of the opposite of trust namely distrust, danger and fear. It is the ‘iron cage bureaucracy’. Coming from Eastern Europe, Markova has experienced this type of bureaucracy personally. For her the difference between communist bureaucracy and capitalist bureaucracy is that in a capitalist bureaucracy one may be punished for disobedience for example by not getting a promotion whereas in communist bureaucracy one can be killed for disobedience. Another image is a painting of the Belgium painter Margritte. 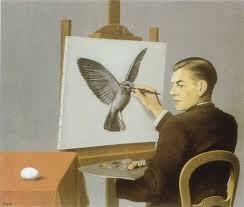 The painter in the image paints a flying bird while looking at an egg. Markova reacts with a smile: “May be this painter trusts the future…”. 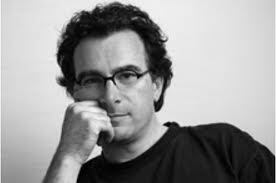 Rober: “May be the therapist can trust that in the client’s story there is something that gives a result…”. After having listened for quite some time now we were asked by John Shotter and Jim Wilson to talk for a few minutes with a neighbour in the audience about what had been popping up in our minds so far. The question that had popped up in my mind was: what if individuals experience fear that there will not be a common ground? 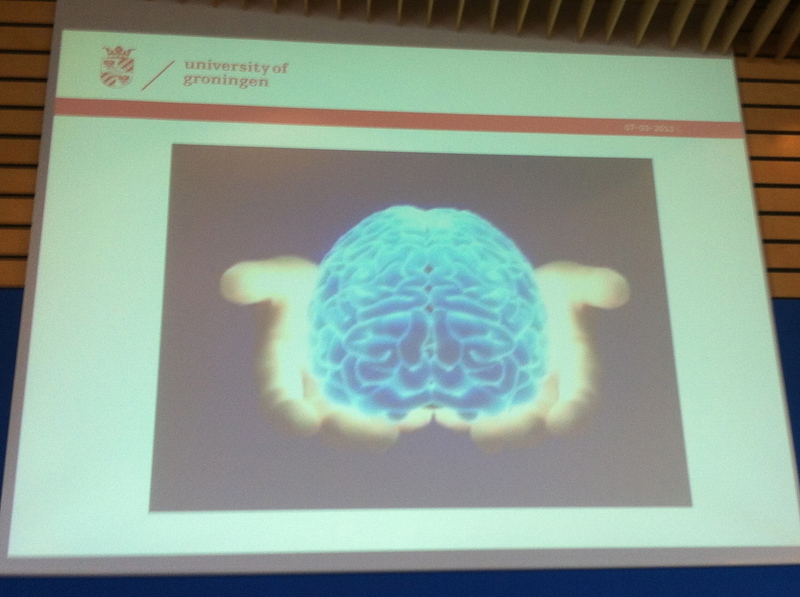 The question that popped up in the mind of my neighbour, a young psychologist from the Netherlands, was: How can I have a dialogue with my client when my superiors expect me to diagnose the client from an expert position? A mental health worker from Norway shared what had popped up in his mind. He claimed that there is a longing amongst therapists to put the emphasis back to the therapeutic relationship. This longing has never disappeared but has long not been spoken about. “Where did it all go? I look for words that we can speak out loud again about this relationship instead of using words such as diagnoses, recipes and protocols”. John Shotter told us that Tom Andersen (the Norwegian therapist that made a name for himself with the concept of the reflecting team), said that words were like hands. We can touch people with our words. Sometimes we notice that words people express, touch them as they speak them out. Shotter: “If you notice this, go further into this word”. Here Shotter uses the first word in the title of the working group I will be taking from him and Jim Wilson these three days: “Noticing, listening, being, acting: being-in-the-movement-in-the-moment”. It appeared to be a big working group of about 50 people. Too big for a group to really work well. All the same, it was good to be in the company of these people and to be part of the struggle to make the group work. A bonus was that Jim Wilson gave us his reaction to the painting of Margritte: “Maybe the painter thought; where the hell did this egg come from?” Jim perceived the painter as looking surprised at the egg. Noticing which words are used by clients is very important. We can find meanings in dictionaries but individuals give their own particular meanings to words. Noticing special moments and listening are more important than acting. “For a human being there is nothing more terrible than a lack of response”, says Mikhail Bakhthin. Shotter adds: “There is nothing worse than if nobody listens”. We talk a bit more about trust. To resist cruel things from happening creates trust. We can then experience the common ground we have. We talk a bit more about tension. How can we accept to live in uncertainty? To work in a dialogical way does not mean that we will always feel comfotable. It is a challenge to move between ‘being in the moment’ and ‘doing something’ in a rhythm. At the start of he second day of the Congress, I walked up with Ivana Markova from the hotel to the ‘Procinciehuis’ where the Congress was held and tried to talk a bit more about the two types of bureaucracy that where mentioned on the first day. I had heard that in the communist GDR crèches had been for free and that parents could bring their children without having to fill out all kind of forms. So much trust and for free! Markova knew about these creches. And she knew that after the unification with Western Germany these creches became expensive and that parents had to fill out forms. Of course this short dialogue between us did not change Markova’s criticism on communist bureaucracy. Later I thought that possibly capitalist bureaucracy is much more clever in hiding their violence than communist bureaucracy is/was. Day 2 was opened by Justine van Lawick. Justine feels anger about the immense body of burocracy that has come over her work. This burocracy makes her having to say things to clients she doesn’t want to say. She introduces Robert Whitaker to us. Whitaker is the journalist who wrote ‘Mad in America’ and ‘Anatomy of an Epidemic: Magic Bullets, Psychiatric Drugs and the Astonishing Rise of Mental Illness in America’. The introduction of psychofarmaca promised a revolution but after extensive research Whitaker comes to the conclusion that these drugs worsen long-term outcomes and lower recovery rates from mental illness. These drugs make people more vulnerable because they end up with a dopamine oversensitive brain. Another word for psychofarmaca is anti-psychotics. With a name like this they suggest that they have the same effects as anti-biotics. But we see more and more non-functioning people and increasing disability rates. Jaakko Seikkula (psychiatrist) has a conversation with Whitaker about the myth of the promise of psychofarmaca. Psychofarmaca were supposed to present us the great leap forward in mental health: “We have found the drugs that can cure mental illness”, they said. The problem is that science is involved in this myth but that there has been no rational discussion of the evidence. Once people tell themselves a story they go through great lengths to preserve this story. Seikkula has seen that people have a natural capacity, a resilience to recover from psychosis. The treatment should help to built bridges back to the community. Good therapy helps people to maintain a narrative. Trudy Dehue, philosopher of science, speaks then. Dehue finds it very important that science, before it investigates anything, properly defines what its subject of investigation is. What is depression? What is poverty? She shows that even to define what a man and what a woman is, is not that easy. And she makes us aware of how things in science are defined. For example: that Pluto was called a (dwarf) planet was decided by hand raising. 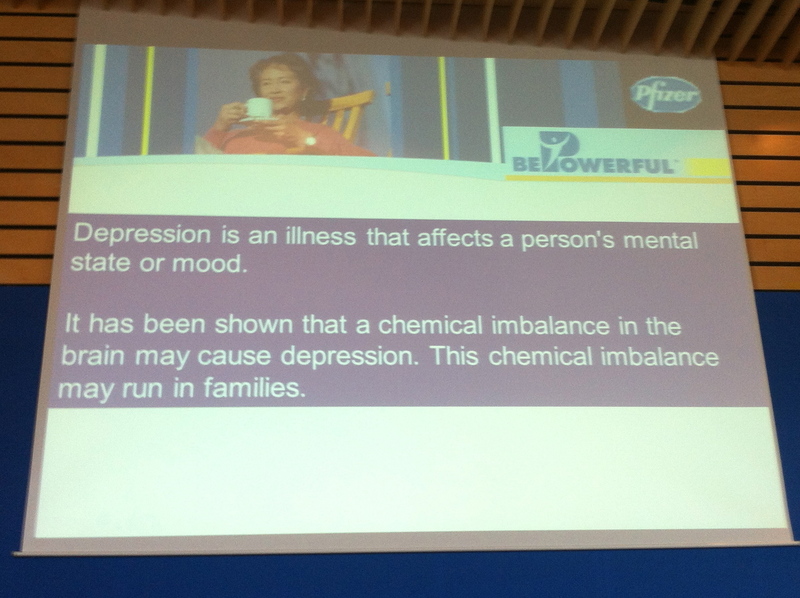 Here an example of how the pharmaceutical industry defines depression. According to Dehue planets do not really mind which name they get, but for humans it is a lot more important which name they get. Scientists influence people and at the same time scientists are influenced by society. According to realist philosophy, science discovers reality but according to neo-realism, science creates reality. Dehue has a problem with trusting Universities. She shows how in a laboratory there was a decision made about the definition of a depressed rat. They used the ‘forced-swim-test’. How long the rat struggled not to drown was indicative of its level of depression. How we define humans as being depressed appears to be less clear. She worries about the message that people receive that they have to work harder at themselves to not become depressed and that they have their brains in their own hands. Children are being taught that they can learn to become less aroused under stress. She finds brain-pictures dangerous because they are full of assumptions. Dehue worries about how our society makes us personally responsible for everything that goes wrong in our lives. She shows us a videoclip of a crying woman on a platform, made by the satirical American News Scource: The Onion, which makes us aware of how human emotion is not a welcome aspect of our lives. We are given the assignment to try and find words to express the therapeutic relationship. To try and find words that do not ‘thingify’… to try and talk in a way that nothing is being separated from its context… to try and talk about our practice without identifying categories … to try and talk about unique experiences. Can we talk with hesitation? Can we be there for the other person? One of us talked about an experience where the client cried for almost the whole session and where he, being the therapist, had felt embarrassed for nearly the whole session. It appeared that there had been some wisdom in listening to his own embarrassment and not to act upon it. Things do not always have to be talked out loud. Sometimes you do or say something as a therapist and later you think: Why did I do this? In this example the therapist had identified with a boy and had guessed the boy’s thoughts and had spontaneously expressed them: “If you really are my parents you would not sent me away, would you?” It was an unplanned intervention. It happened to cause the boy not to talk in a strange way any longer after this intervention. To wonder later about why you intervened in a particular way can make new things visible. You may have had a reason that was not visible yet. We can feel a tension between doing something and not doing anything. We can feel a restlessness in our body that does not leave us alone. We can use sentences to be open about this and we can allow ourselves to feel the tension. Do I dare not to run away if someone cries? One dares things, embarks on things, if one can trust. You may say: “I feel that what you are saying is important to you”. Utilize the tension in the dialogue creatively. Be totally present in the moment. We continue not to talk about things; not to talk about things like ‘psychotic episodes’. We want to talk in ordinary everyday words about our work. This is different. We aim to talk about particular and unique characteristics. Let’s talk in a way that engages people. Let’s talk genuine and not jargon. Today we split up in small groups. The following is a summary of remarks made in my group. We want to talk with the client in a kind of speech that we also have with friends. We want to talk as a friend even though we know that the patient is not a friend. We both have our own context. We want to step out of the role as the one ‘with the key’ (isolation). How to become an appreciative ally. See the patient as a guest. May be collaborator is a better word than friend. I have two voices, the voice from home and the voice from my profession. Maybe we can invent a third voice, an ‘in between’ voice. Can we make this third voice an authentic one. We want to be comfortable with that third voice. One of the psychiatrists in my group shares that he sometimes thinks the place he works in is so bad that it should be closed. How does he balance these thoughts in the interaction with the patient? He could say: “There are so many limits within this institution. How can we deal with your psychoses in the best way within these limits? Two people collaborating. We like to stay close to our personal style. Of course our style can change for example after having been to a congress, a course, after having seen a film. We have learned in the past that symptoms are ways to solve problems. This is an old psycho-analytic notion. Old voices are also in the dialogue of to day. Psychoses are ways to solve problems. We could talk in a collaborative way about developing new and different symptoms with the patient. How do we find common ground with people we do not know? Do we allow them in our space, do they allow us in their space, their situations. Is to feel and to be in the movement and the moment utopia? Do we need to go from common ground to resonance? We do need some common ground but there will always be difference, tension. In the tension we can move. As I mentioned above; the congress ended with a loud ‘fireworks’ performance of percussion by the Belgium group: Lokomotiv.